A German Shepherd is one of the most popular dog breeds in the world. This dog breed is a fierce protector but friendly within a loving family. They are calm and are confident in nature. They have a proportioned and commanding look. They also have muscular shoulders and legs with solid back legs and a bushy tail. These dogs are intelligent, loyal and hardworking and are one of the most popular serving police dogs globally. The bite of a German Shepherd has a force of 238 pounds. The German Shepherd is the 2nd most popular registered dog in the United States. 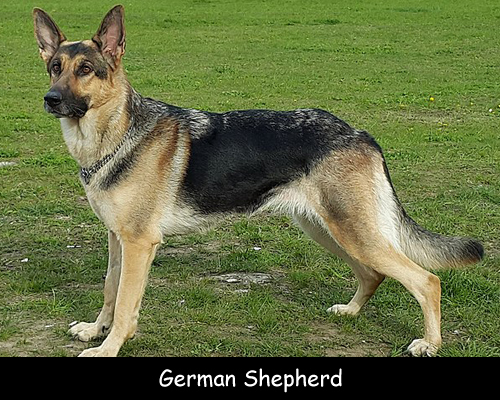 Max von Stephanitz is a dog breeder who is considered to be the father of the German Shepherd breed. When well trained they obey the first given command ninety five percent of the time. The dog breed is from Germany. These were working dogs in Germany acting as sheep herders from the late 1800’s. The average lifespan of these dogs ranges from 10 to 13 years. They shed hair very frequently so their coat needs to be combed every day. They get along with children very well and also with other pets if both are raised together. These dogs really love to play and are extremely active. They are naturally curious in nature and this is the reason why they are perfect for search missions. A female German Shepherd has a litter size ranging somewhere from 6 to 10 puppies. Declan, Tobin. " German Shepherd Facts for Kids ." Easy Science for Kids, Apr 2019. Web. 26 Apr 2019. < https://easyscienceforkids.com/facts-german-shepherd/ >.